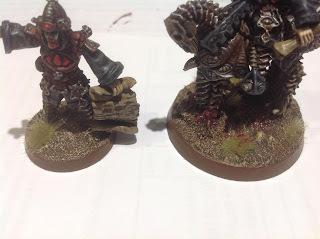 For a long time I have wanted to include Fell Bats in my undead forces and unfortunately the current GW miniatures are really old and unfit for purpose. So earlier this year I spent some time rifling through my bits boxes to see what I could come up with. These are the results of which I am rather proud. 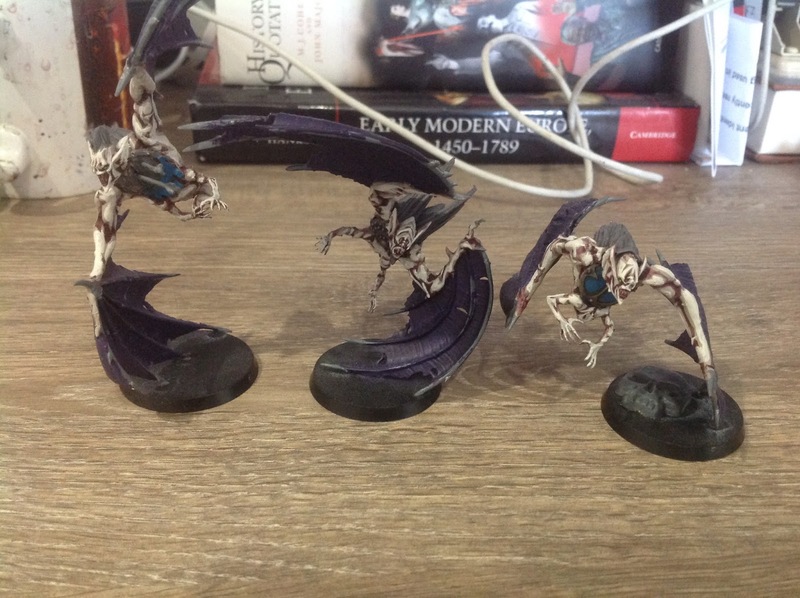 I forgot to take pictures of them without paint (I got excited and started painting right away so these are very WIP pics) but I think its fairly obvious what I've done here. These miniatures can be put together quite easily, and are made from pieces most Death players likely have lying around. 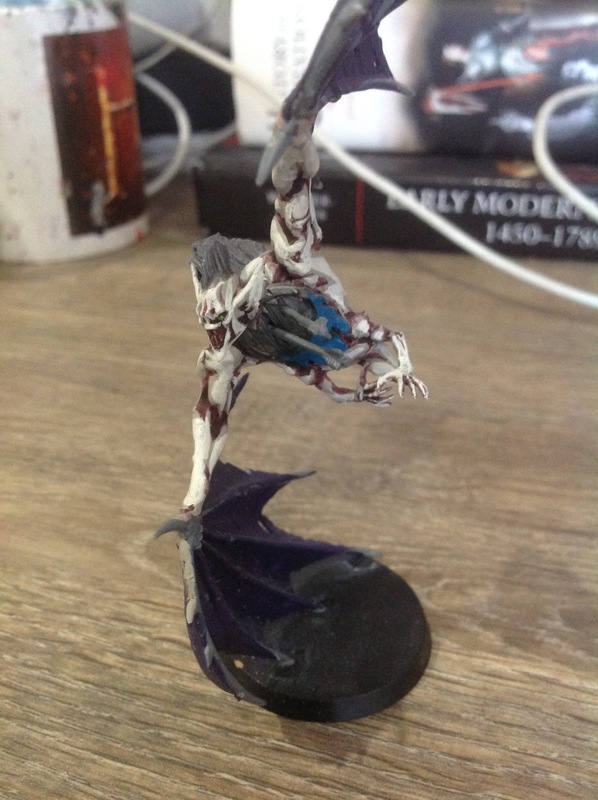 The base of this conversion is the spare pieces from assembling a unit of Crypt Horrors. If you assemble the Crypt Horrors you will be left with the wings, hairy back, and head of the Vargheists. I began by taking these pieces and gluing them together in a flying pose. The heads glue really easily onto the top of the hairy back piece and the wings can be glued to roughly where the shoulders should be with relative ease, though you may need to cut the joints a little for the best fit. For the claws I then took some spare Ghoul arms and glued them to the bottom of the back piece. This may require cutting down the shoulder joint of the arms a little. I also elected to go with arms that weren't holding any items and showed the bare claws. This leaves us with all of the bat except for the front of the torso. You could green-stuff in some muscles or something but I elected to glue a skeleton shield to the front of the body for ease. The round shields from the Skeleton Warriors kit cover this front area quite nicely and I thought it would provide a nice space to display the colours and heraldry of an army. After all, I like to think of these bats as a proud Vampire/Necromancer's pets that they would want to cover in their personal colours or sigils. As an extra detail I added some arrows poking out of the bat above to show where enemy archers had tried to bring it down. I then used some green stuff to fill in gaps, make small tails, and generally smooth any connections that didn't look quite right. 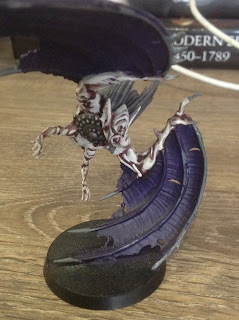 Finally they were glued to a standard 40mm base by their wing-tips (I'm not a fan of using flying bases but they could work equally well) and where necessary I glued coins to the bottom of the base to make sure they wouldn't fall over. I believe these Fell Bats are a fair bit larger than the current Fell Bat miniatures but with a more dynamic pose and more modern pieces I think you'll agree they are much better. 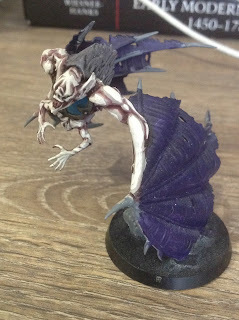 I also think they fit within the aesthetic of most undead armies better than using Tyranid bits, which seems to be the most common means of converting Fell Bats that I have seen previously. I'm sure that others will be able to refine this method further, but for now I rather pleased with my Fell Bats and I hope it inspires others to try rooting through their bits boxes to see what they can make!